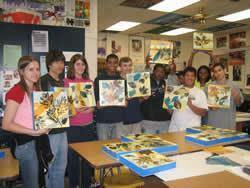 East Mecklenburg High School art students display completed collages. Hodges Taylor Gallery and Community School of the Arts partnered in 2006 on behalf of the new Levine Children’s Hospital to coordinate and select artwork for the hospital. Shug Lockett was chosen as one of several teaching artists to design and conduct a workshop to create artwork with local school students some of which would be chosen to exhibit in the new hospital. McColl Center for Visual Art is a nationally acclaimed contemporary art center dedicated to connecting art and artists with the community. Located in a historic, neo-Gothic church in Uptown Charlotte, the Center houses nine artist studios and over 5,000 square feet of gallery space. 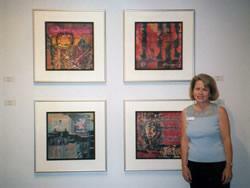 In 2003, Shug Lockett was selected as an Affiliate Artist and held a 4-month residency at the Center. While at the center, Shug worked on her Signum and Echoes from the Past series, which combine images from antique letter seals, historical photographs and letters with printed images and stained tissue papers. Since her residency, Shug has served a term on the McColl Center Board of Directors and recently exhibited work at their Studio 12 event. In 2002, the Mint Museum of Art and McColl Center for Visual Art co-sponsored a juried exhibition entitled Celebrating the Legacy of Romare Bearden: A Juried Art Exhibition. David Driscoll a noted collector, writer on African American art and professor emeritus at the University of Maryland, juried the Exhibit. Fifty-six artists from North and South Carolina were selected from a field of 135 to exhibit their work at the Mint Museum of Art and Spirit Square. 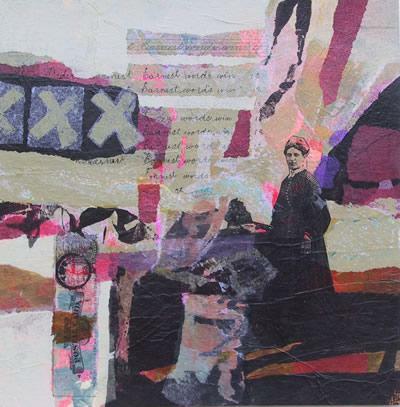 Shug was chosen to exhibit her collage entitled “Earnest Words” which incorporates an old family photograph and pages from a penmanship manual from the 1880’s with stained tissue collage papers.